Our Colorado string quartet collectively has over 100 years of experience. We have been playing violin, viola, and cello since we were tiny, and all of us have been playing in a wedding music ensemble since we were teenagers. Each member of our string ensemble has a unique background, and we believe that makes us a stronger team. We share a passion for providing the best wedding music in Denver and the surrounding areas, and we pride ourselves in being one of the most affordable Denver wedding music providers. 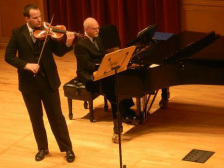 Sam has been playing violin since he was a toddler and graduated from the Lamont School of Music at the University of Devner with a BM in Violin Performace. He is currently the Concert Master of a local Symphony in the Denver Metro Area (The Aurora Symphony Orchestra) and has over 10 years of teaching experience in Violin and 4 years in Viola. Sam's beautiful melodies on the First Violin parts are not to be missed! Emily has played since the age of 5, with groups including the Indianapolis New World Symphony Orchestra and Boston College Symphony Orchestra. She's even been a soloist four times with the rock band Guster. She has performed in a Denver classical string quartet setting since she moved to Colorado in 2009 and brings great positive energy. She is currently finishing the 2nd year of her Masters in Business Administration at CU Boulder. Karl is very active in the local Denver classical musicians scene. Playing in baroque and classical orchestral settings alike, he brings a breadth of knowledge and experience to the group. His ability to select classical wedding music is astounding, and he knows which popular wedding songs (such as the Beatles) are real crowd pleasers. Karl received his BA in Music Education and Viola Perormance from Arizona State University and studied Early Music Performance at Windham College. He also teaches many violin and viola students. Erin is an extremely talented violinist who teaches in her spare time. A Colorado native, Erin loves to perform and travel. In our classical Quartet setting, she plays with passion and does an amazing job bringing out the emotion within the music. She is quite the classical wedding quartet member. Camilla regularly joins the cello sections of the Colorado Springs Philharmonic and Boulder Philharmonic Orchestras and maintains a small teaching studio. She can be heard on the Albany recording label performing with the Grammy-nominated ensemble Voices of Change. Camilla and her husband, double-bassist Joel Bonzo, are co-founders of ANIMAS chamber music, which performed the U.S. Premiere of Ralph Vaughan Williams' Piano Quintet in C minor in 2006. Having played the cello for almost 20 years, Andrew is very happy to have the ability to do what he loves - play beautiful music for wonderful people. Classical Wedding Music is his specialty. He currently works in Marketing full-time.